Ben Brusey, publishing director at PRH's Century, acquired world rights in the project from Rory Scarfe at The Blair Partnership on behalf of Tony Pastor at Goalhanger Films. The book, also called Behind Closed Doors, will be published on 5 September by Century in hardback and eBook, with a simultaneous audiobook publication from Penguin Random House Audio. Lineker and Baker will support the publication with live events and signings this autumn. Behind Closed Doors is, according to the acquisition statement, 'a rollicking inside guide to football that shares never-before-told dressing room tales and green room stories from Gary and Danny’s time in football and broadcasting. The book is based on the pair’s acclaimed Number 1 podcast of the same name produced by Goalhanger Films, which was the fastest growing sports podcast in the UK in 2018. 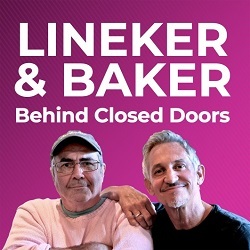 Lineker said: "Since Danny and I started recording the podcast, we’ve been overwhelmed by the fantastic response from the public. We’ve had loads of fun recording the episodes each week and it made us realise just how many stories we wanted to tell. Our book will be full of new stories, and more detail on some of our old favourites. "We’ll be elaborating and pontificating on many of the spirited debates we’ve had thus far. And it will of course have the same blend of anarchy and joie de vivre that runs through the podcast. Our old mate Paul Gascoigne may even get the odd mention." Brusey said: "Gary Lineker and Danny Baker are a dream strike force. They are broadcasters and writers at the very top of their game – much loved, revered and unrivalled. Like their brilliant podcast, this book is funny, enlightening, at times riotous, and always richly entertaining. We are enormously proud to be publishing Gary and Danny, and to partner with the Goalhanger team. This will surely be one of the very biggest non-fiction books this autumn."